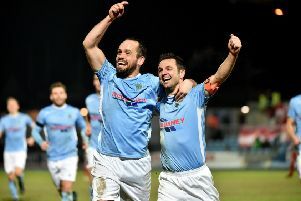 Darren Murray enjoys the celebrations following a goal for the striker in Monday's defeat of Glentoran. Pics by PressEye Ltd.
Portadown and Glentoran served up the latest free-scoring fixture on Monday in one of the modern Irish League football’s greatest rivalries. Fans at Shamrock Park were left drained by Peter McCann’s 2002 finish or Keith O’Hara’s late strike in 2005. This week’s rearranged game may have lacked the sheer tension on show in those two past encounters but exceeded both 4-3 wins in terms of goals. The win proved key in terms of a welcome off-field home gate before the end of 2015 and on-field victory that pushed the Ports three points closer to Glentoran in the Danske Bank Premiership standings entering the hectic festive period. Suspensions forced Portadown into a defensive reshuffle and Tim Mouncey proved solid as a makeshift centre-back. Chris Casement, traditionally a right-back, continued in his recent advanced role and produced an early assist for Gary Twigg to slide home and convert a drilled cross on four minutes. Glentoran responded with two goals to turn the tables - the first a deflection off Marcus Kane’s long-range drive before Curtis Allen slotted home a Jonathon Smith knockdown. The Ports, however, then regained control before the break. Darren Murray proved alert to latch on to a blind backpass underhit by Niall Henderson and the striker delivered a delicate finish over Elliott Morris. Robert Garrett then opened his account for the season with a low angled drive from outside the area that nestled inside Morris’ right-hand post despite the goalkeeper’s full-length dive. On a night that offered limited talking points beyond the goals, both sides continued to maintain the scoring touch in the second half. Strong play by the tireless Twigg along the left flank released Murray and the forward bustled a path towards goal before releasing a low curling shot which squirmed under the body of Morris. Home celebrations were cut short within moments as Glentoran hit back thanks to a second of the evening for Allen - with the striker’s back-post header turning home a deep throw-in which Portadown failed to clear from inside the danger area. Portadown regrouped and regained control in the closing stages thanks to a clinical Twigg volley. The forward reacted with a crisp left-foot strike to smash home the loose ball inside the box and secure full points. The reshuffled Ports headed for the dressing room elated on an energy-sapping night that increased the unbeaten run to four league games and an end product of 10 points from 12 on offer during this recent rejuvenation.